Cool Dining Chairs for the Coolest Dining-Room! 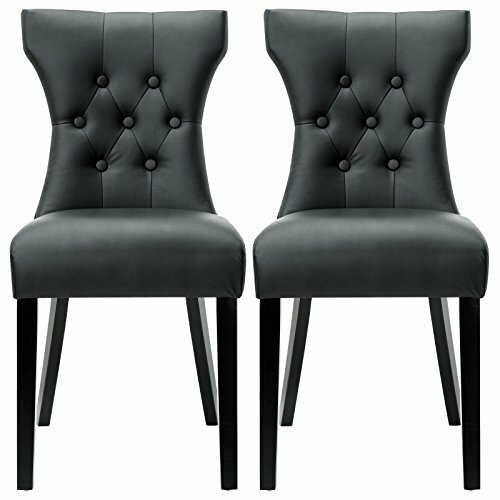 My Favorite Unique, Fun, Modern, Coolest Dining Chairs! The quickest way to spruce up any dining-room in my opinion is to buy some cool looking dining chairs! 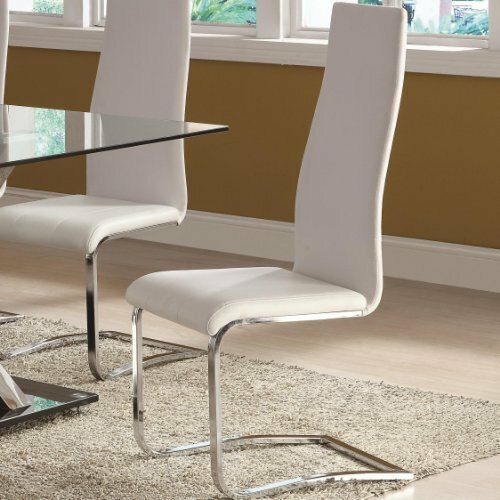 They usually come in a two-piece set, but I personally prefer sets of 4 chairs, just like these gorgeous white color dining chairs with wood legs you see in the picture above. If you have a nice looking glass-top dining table, for example, you can pretty much buy any kind of modern looking dining chairs! 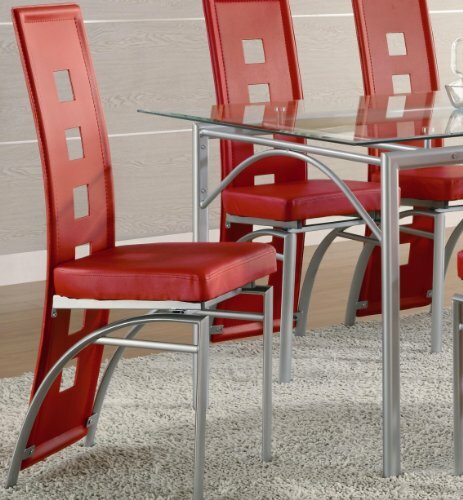 Very Cool Stylish Dining Room Chairs in Fun Colors! If you are looking for the coolest and most fun looking colorful dining chairs for sale, I think you can pretty much stop looking! They can’t get any more fun and colorful than these! They are available in several cool colors and fun patterns! Your dining-room will look so cool! If you are looking for a modern and affordable dining-room chair set for sale, I think you are going to like these! They are also red, (which is a perfect color to have in a dining room, as it makes people feel hungry), made from a leather-like vinyl and metal legs. They go awesome with a cool glass-top dining table! 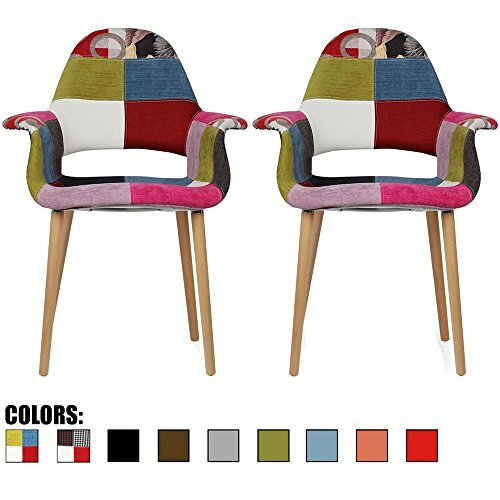 Unique Colorful Patchwork Pattern Dining Chairs! These patchwork pattern chairs are by far the coolest dining chairs I have ever seen! They have wood legs and the most fun patchwork padded seats around! These cool chairs will match any light color wooden dining table, white or even black! They are also very comfortable! 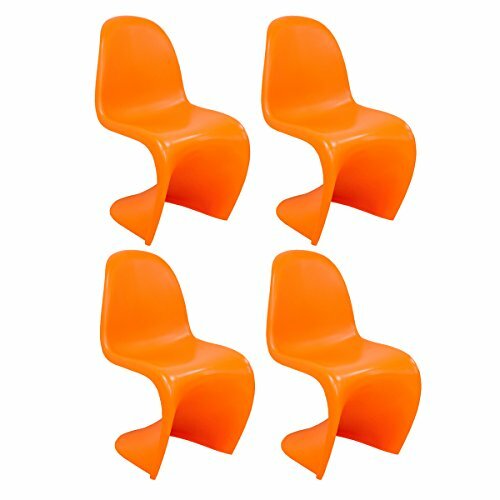 These cool bright orange S-shaped dining chairs are made of ABS plastic and are available in many gorgeous colors! They come in sets of four and all you have to do is pick your favorite color! They are a little on the expensive side though, but if you want to have the coolest dining-room on the block they might be worth the price! You are in for a treat now! 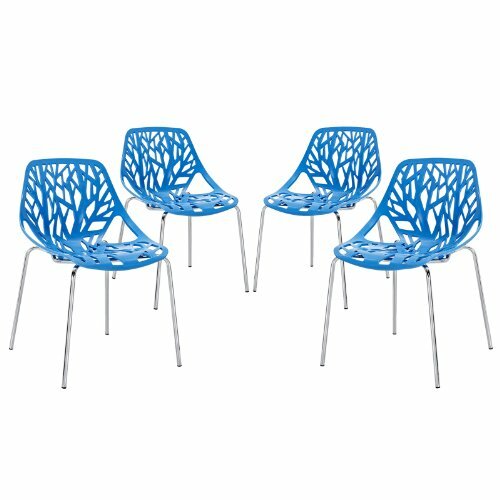 Cute, fun and colorful tree design dining-room chairs! You will get all four of them! They are made from molded plastic and a chrome base. 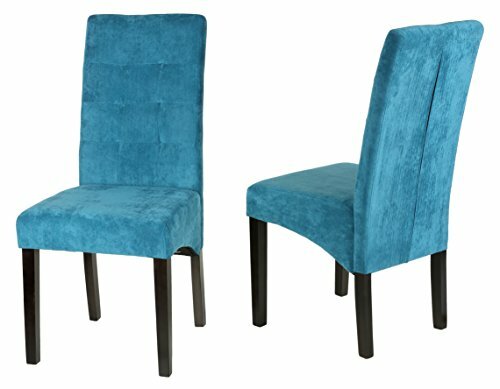 Beautiful Blue Microfiber Dining Chair Set! 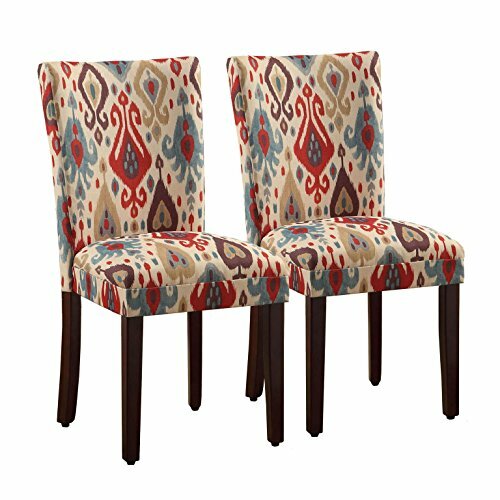 I also love this beautiful, fun and elegant looking blue microfiber dining-room two chair set for sale! The legs are made from solid wood and they are very easy to put together! You can get two sets or even three and create a gorgeous and cozy dining-room for your family! Cool and Affordable Dining Chairs! If you are looking for cool, comfy and affordable modern dining chairs for sale today, I think you are going to be pleasantly surprised with these! They are also very elegant looking! Each chair has a very nice dense foam padding to make them extremely comfortable on your back while you are dining. The frame is made from birch wood and you can get them in black or white. They are also very sturdy and can hold a heavier person with no problem. 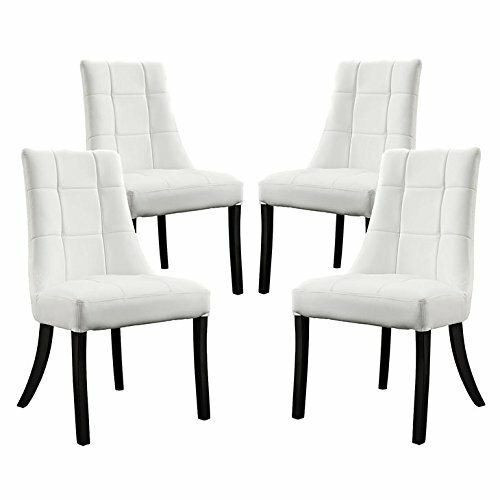 This is a beautiful, elegant and very modern looking set of FOUR white faux leather dining chairs with chrome legs for sale! White is always a great color to have in the house! It brightens up the rooms. Will look amazing with a beautiful glass-top dining table! I love how unique and stylish they look! Stunning Chocolate Brown Wicker Dining Chairs! 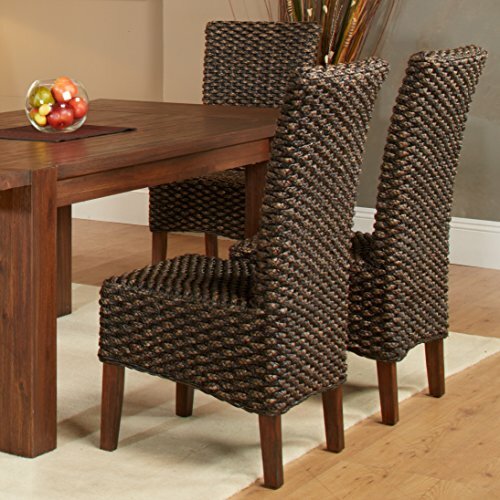 And last, but not least, a stunning looking dark brown wicker dining-chair set for sale! It is very elegant, comfy and extremely stylish! Perfect to create a gorgeous ‘earth tone’ dining-room in your home! Have the most fabulous dinners with your family and friends! Beautiful and Unique Dining Table Sets!